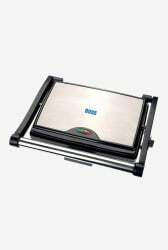 You can enjoy different varieties of breakfast and snacks everyday with the BOSS Jumbo B513 1500 Watts Grill Toaster. This toaster comes with non stick coated plates, which helps in easy cleaning and maintenance. Besides, its 105 degree opening makes it simple and easy to use.